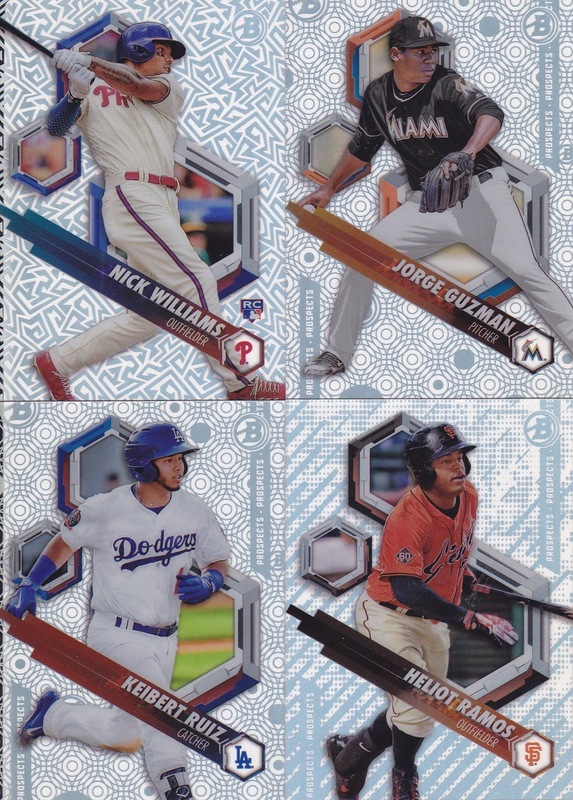 The sophomore season is one for making adjustments, and Bowman has done just that with 2018 Bowman High Tek Baseball. Following up last year’s debut, Bowman has upgraded the design of the multi-patterned acetate cards for a more palatable user experience. The series focuses on top rookie and prospects, keeping in stride with Bowman’s reputation for highlighting the next wave of talent in the baseball pipeline. Each box contains ten cards, four of which are on-card autographs, an appealing proposal for those in search of adding to their prospect stash. 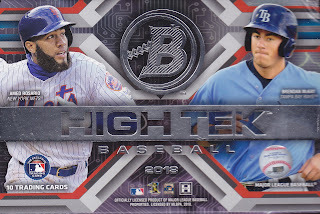 One thing that sets 2018 Bowman High Tek apart from its more traditional trading card counterparts, are its ten, that’s right, ten different base card parallel variations. (Click here for detailed guide of each pattern.) 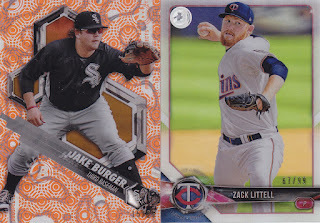 Compared to last year’s release, Bowman increased the size of the player’s name and team in a way that further accents the photo and make the player easily identifiable. While the box provided for this review did not yield any of the rare patterns, it did feature a Jake Burger Orange Magma Diffractor numbered to 25. 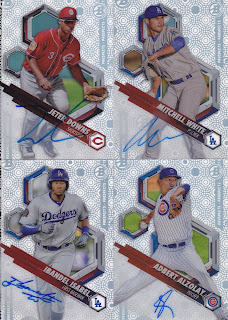 The tipping point for Bowman High Tek is the four guaranteed autographs in each box. This year’s signers list is strong, featuring over 45 different prospects, including Ronald Acuña Jr., Gleyber Torres, Rhys Hoskins, and Royce Lewis. Noticeably absent is Washington Nationals upstart Juan Soto; however, with an abundance of top tier talent, fans are rather likely to catch at least one rising star, if not more. Cincinnati Reds power prospect Ibandel Isabel (pictured with the Dodgers) and Chicago Cubs pitching phenom Adbert Alzolay led the way for the four autographs in this box. Aside from Isabel’s penmanship, the other three players who signed cards for this box could use a lesson in cursive, as their signatures amounted to undecipherable scribbles, a seemingly growing trend in the minor league ranks. With boxes settling in under $100, collectors are primed to take a chance at the four autographs 2018 Bowman High Tek offers, with any of the rare base card patterns serving as the icing on top of an already heavily layered cake. Click here to get a hold of a box of 2018 Bowman High Tek.